If you're looking for the ultimate in arrive-and-fly airport parking, Good To Go Meet & Greet T2 is the solution for you. Great for anyone travelling on business, with young children or bulky luggage, simply drop off your car in the Short Stay car park and head straight to the check-in desks. No transfers, just a short walk while your car's parked for you. While you're away, your car will remain parked in a nearby, airport-approved car park for the duration of your trip. Good To Go Meet & Greet T2 is suitable for Blue Badge holders. If you are using a sat nav, please enter the postcode TW6 1EW. Leave M25 at J14, following signs for Terminals 2 and 3 on the Western Perimeter Road. Go through the main tunnel to the Central Terminal Area for Terminals 2 and 3. Keep right as you exit the tunnel. Pass the Central Bus Station and join the final approaches to Terminal 2 on Cosmopolitan Way. Stay right as the road climbs to Terminal 2 Departures and the Short Stay 2 car park. The ticket will be returned and the barrier will open. Please DO NOT take another ticket. Park in a dedicated Meet & Greet bay & register your arrival at the Meet & Greet office. Follow the signs for the Short Stay Car Park. We recommend you use either of the entry barriers 1, 2 or 3, left of the six lanes available. Please DO NOT take another ticket. Park in a dedicated Meet & Greet bay & register your arrival at the Meet & Greet office. 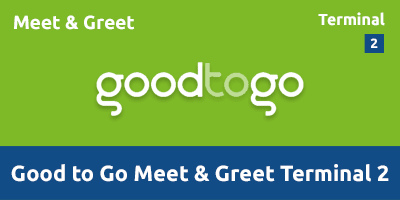 On your return, make your way to the Good To Go Parking Meet & Greet reception located on Level 1 of the Short Stay Car Park. Here you will be given your keys and shown to your vehicle.